I had no plans to blog about Mike Brown. I thought, this happens so often, as tragic and horrible as it is, what more can I say that I haven’t already? Two things changed my mind. One, I saw an absolutely stunning photo of a silent protest at Howard University where hundreds of solemn black faces stood with their hands up. No words were needed. It was peaceful, it was powerful, and it was in direct opposition to the fear and violence that swept Ferguson, Missouri this week. Then I read a beautifully written piece in Salon by Brittney Cooper: “In defense of black rage: Michael Brown, police and the American dream,” discussing the mentality behind racism, and I had to chime in. To protect and serve is a police mantra. It’s a statement of intent. It does not predicate race, gender or any other dimension of diversity. 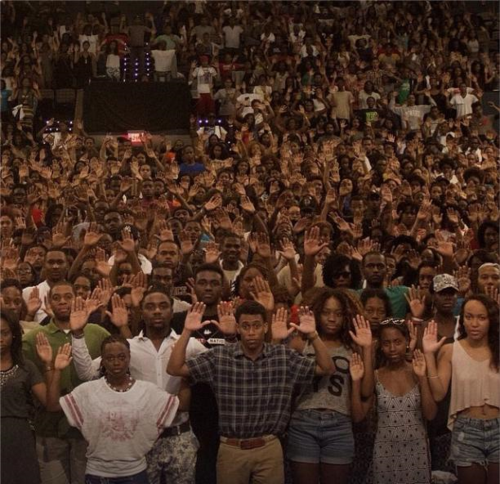 Darren Wilson, the officer who killed Mike Brown, was wrong to shoot this unarmed teenager who held his hands up in a universal gesture of supplication and surrender. Period. But there likely won’t be any accountability or punishment for his actions. Now, nearly a week later, the Ferguson, Mo. police have embarked on a mission to distract with a story that Brown was a suspect in a robbery. What does that have to do with a police officer shooting an unarmed man down in the street like a dog? No, there won’t be any justice, and if there is, it can never outweigh this senseless loss of life. And these murders will continue because of the bias and prejudice that people have against Black people, and black men in particular. In the eyes of the world, black life has no value. Therefore, to kill one black body is no different than putting down an animal that bites someone or has become a nuisance. It doesn’t matter that Mike Brown’s murder was tragic, that had he lived, he would have already begun his first year of college. It doesn’t matter that we’ll never know what positive changes he might have made during his life to counteract this widespread view of the black body as less than, deserving only of mistreatment, degradation and suffering. It is this idea of less than, that African-Americans – and diversity executives – have to fight against. We also have to take responsibility for changing how the world views and treats minorities and in this case, Black minorities. If we don’t, nothing will change. There will be more baseless killings, and more protests and violence will tear apart our communities, and that’s a waste – of time, of life, of resources, of everything. Many years ago, a woman who shared my perspective on the need for our people to stand up and do better explained her position by likening what needs to happen in the black community with what happened in Japan after Hiroshima. She essentially said – this was awhile ago so I’m recounting sentiment more than actual quotes – after the bomb that entire country was in chaos. Most of the young men had been killed in the war or were maimed and thus unable to fulfill their rightful functions in society. Yet, the people banded together, and in the space of one generation turned that entire country around and became a global superpower. In a public address Thursday President Obama talked about ensuring public safety without infringing on our right to peaceful protest and exercising our first amendment rights. He said, “We all need to hold ourselves to a high standard, particularly those in positions of authority,” and reminded the nation that this country was founded on principles that promise equality under the law, reverence for the dignity of every single man, woman and child, and accountability when it comes to our government. That bit about holding ourselves to a higher standard is the kicker. African-Americans have all we need to ascend to our rightful place in society. Most minorities do, the idea that they don’t is antiquated misinformation and bone deep, wide spread bias. The difference is, so many Black people are not accountable for ourselves. Don’t be confused. No one race or group is perfect; there are good and bad people in every demographic. But in this country too many black men are killed in the street for no other reason than they’re black. It’s up to us to change that. No one else is going to help us stop this trend. We certainly cannot always rely on those in positions of authority to protect us or to treat us fairly because many simply don’t think we’re worth it. Advance warning, I’m about to have a Bill Cosby moment here so bear with me. If we don’t educate ourselves, build strong families, cultivate self-love, revel in our individual beauty and work our tails off to ascend and fulfill the promise of potential and talent so evident in our people, we’re going to die. Whether we’re killed in the street, or we die natural deaths without having done our best to live and partake of all the wonders this world has to offer, we’ll be dead. And our legacy will be a litany of tragedy, murder and wasted life. This post also appeared in Diversity Executive magazine online.